Now that you’ve made the exchanges in your Christmas or Chanukah gifts, do you think it’s time to begin thinking about the changes you want to make in yourself this coming New Year? Be open to trying something new. Let your creativity flourish as you open yourself up to new possibilities. You can strive for something that may have eluded your grasp in the past. Search for a different way to get to where you want to be. Keep your resolutions realistic. When you honestly believe that you can attain your target, you’ll work harder to move in that direction. Setting overly ambitious, idealistic targets that you’re unlikely to reach can stop you cold even before you begin. Break your goals down into smaller parts that you can complete, one at a time. Baby steps taken one after another will transport you a long distance. You’ll feel freer to continue knowing that each objective is within your reach. Visualize yourself accomplishing each objective you set. Athletes are more successful after envisioning themselves playing well. When you create a picture in your mind of going through each step you need to succeed, you’ll find that the process is easier to finish. As you likely know, making the commitment to change is only the first part of actually achieving your goals. It can be difficult to stay on track and backsliding often becomes an issue. But you don’t have to do it alone. Visit our blog often in 2012 for practical tips to help you stay motivated and chart your progress as you move forward toward accomplishing your New Year’s resolutions. When you reach your target, you’ll recognize that all your hard work was well worth it. 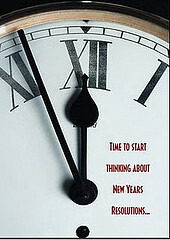 Our very best to you for a safe and happy, healthy New Year as we welcome in 2012.